Bangalore: Tata Consultancy Services Ltd, or TCS, Asia’s largest information technology services company by revenues, said technology spending by US financial institutions will slow in the coming year due to the multi-billion dollar write-offs by global giants such as Citigroup and Merrill Lynch & Co.
“The write-offs are bound to have an impact on 2008 IT budgets as cost management becomes very critical," said S. Mahalingam, chief financial officer, TCS, in a telephone interview. “It is too early to quantify the impact." However, Mahalingam clarified that, so far, TCS has not seen any impact on its current contracts. Financial institutions such as Bank of America, Wachovia, Deutsche Bank, HSBC, Barclays and Bear Stearns, have all taken write-downs ranging between $1.2 billion and $11 billion, following the credit crisis triggered by the slump in the US housing market. 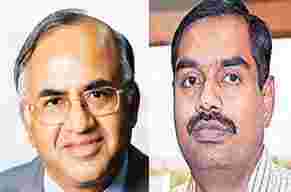 Tech troubles: TCS chief financial officer S. Mahalingam and Infosys Technologies’ chief financial officer V. Balakrishnan. The American clients of Indian IT firms, including Infosys and Wipro, have been affected by the credit crisis. TCS says it is too early to quantify the impact, but some local vendors say a US slowdown would actually benefit them as customers would offshore more work to cut costs and be more competitive. The second and third largest Indian vendors by revenues, Infosys Technologies Ltd and Wipro Ltd, say it is too early to comment on the impact as clients are still in the process of finalizing the budgets. Clients of both Infosys and Wipro have been affected by the credit crisis. “The clean up is not complete and the subprime issue is still there. There’s more pain left and we are closely watching the situation," said V. Balakrishnan, chief financial officer of Infosys. “The write-offs have come as a surprise and have definitely brought uncertainty to the fore once again," said Girish Paranjpe, president, financial solutions business at Wipro Technologies, the global IT services arm of Wipro. Though the write-offs are one-time hits on the balance sheets, still “the impact is so large that nobody will say that their business is as usual", he added. A majority of the Indian IT vendors had largely discounted the impact of the subprime crisis while announcing their second quarter results about a month ago. Avinash Vashistha, chief executive of Tholons, an offshore advisory firm, said due to the current crisis, the financial services sector would continue to remain depressed over the next few years, which could impact the IT spends. “Initial indications were that the 2008 IT budgets will be largely flat with slightly upward trend and offshoring will remain as part of their strategy," said Harit Shah, who tracks the technology sector for Angel Broking in Mumbai. “There should be no major pr-oblem as offshoring is irreversible and should increase also." Indian vendors are confident that a slowdown in the US economy would actually benefit them as customers would offshore more work to cut costs and be more competitive. Also, it would be difficult to reduce spends in areas of application maintenance and support services. “Areas such as business process outsourcing (BPO), infrastructure outsourcing and application management are under-outsourced at present, where outsourcing could pick up," said TCS’ Mahalingam. TCS derives about 30% of its revenues from its banking and financial services (BFS) practice globally. BFS accounts for 33-35% of TCS’ revenues from North America, which contributes to 53% of the firm’s total revenues. BFSI also accounted for 36% of Infosys’ revenues in the July-September quarter, while Wipro Technologies generates 23% of its revenues from the practice.